Hideous as this wolf concert would seem to ears unused to it, there is no more satisfactory lullaby to the habitual roamer over the Plains, for in the language of the section, "If any red­skin should take it under his scalp to look about camp, every cuss of them coyotes would shut his trap and wake the fellers up with the quiet." 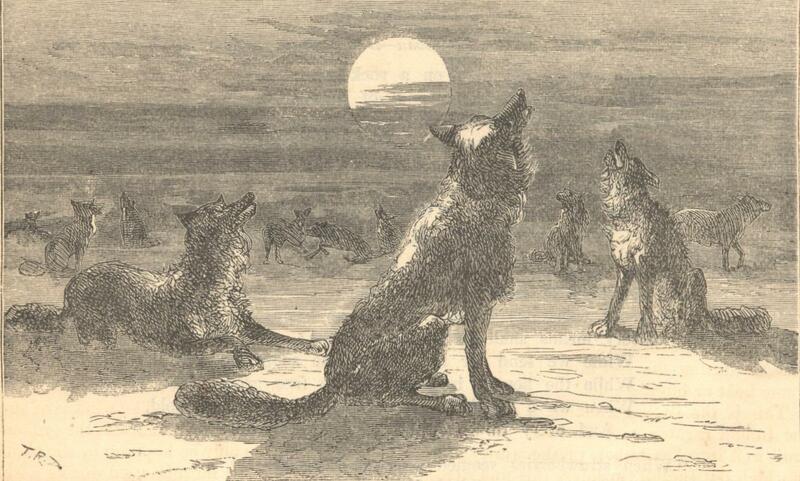 As the small hours of the night come on, a few of the wolves will steal into camp to secure edibles which have been carelessly left within their reach. At times they are so bold as to attempt the theft of a haversack of food upon which the head of a sleeper is pillowed, but sel­dom if ever will they make any attack upon the persons of the campers. As dawn comes, the howling ceases, and a majority of the coyotes be­take themselves to their burrows. Those wolves which linger retire to a safe distance from camp, and there, squatted on their haunches like dogs, await the removal of camp, hoping to secure a few scraps of food which may have been thrown away or abandoned. It is an old saying among Plainsmen, "That the coyotes can smell a States feller, and then you will not see a coyote anywhere within rifle-shot of camp." A considerable experience goes with the Plainsman to bear him out in this assertion. "States fellers shoots at ary a live thing as jumps in their sight, whether it is any 'count to them or no," remarked an old hunter. Possibly this waste of ammunition may to some extent account for the supposed keen scent of the coyotes. The weather on the Plains during the month of November is frequently the most delightful of the entire twelvemonth. It is just cold enough to make the air, pure as it ever is, bracing and exhilarating to man and beast. To the hunter it is the prime season for the en­joyment of sport, and the successful chase after buffalo or such other game as his fancy or need may lead him to pursue. Trading outfits, taking advantage of the "fine days," start out toward the proposed wintering places of the Indian villages with which they are to locate for the season. The great trains of wagons which are being moved across the Plains to Colorado, New Mexico, and the more western Territories, make many more miles of travel during these good freighting days than at any other season of the year; for the roads, dry and hard as they now are, cannot be surpassed by any natural roads in the world; besides this, both man and beast can travel a longer distance without being overcome with fatigue than is possible during the less favorable days of ex­treme heat or intense cold. This is the Indian summer, a season which the Indian regards with distrust. It may last until well into December, or the winter storms of which the Indian considers this fine weather as the precursor may come on within a few days. The red-skinned aborigine will frequent­ly take advantage of the bright days to commit any depredation which he may accomplish with tolerable safety, for the red brother is thinking of making tracks toward some government post, where, after a peace talk, he may settle down for the winter and not go hungry, as he will if he follows the village, which ere this is moving southward, in company with or on the trail of the great herds of buffalo, and other game that has left the Platte, Republican, and Smoky Hill rivers for the more temperate climate of the country to the south of the Arkansas. It would be more proper to qualify the statement that the Indian would go hungry: by this it is not meant that he would starve, for there is too much game, in any section of the Plains where a considerable band of Indians would winter, for actual starvation; but flour, sugar, coffee, and some other articles of food used by the whites, are a pleasant change to the redskin after his long subsistence upon a diet composed entirely of meat. This pleasant weather, the season for the enjoyment of a trip across the great buffalo range, is closed by the winter storms. A dry, powder-like snow will fill the air and cover the landscape. Then will come days and nights of such freezing cold as chills the very bones of the hardiest of the brave fellows whose life is spent in this wild country. The wind is of such cutting sharpness that it penetrates the ordinary clothing, and can only be kept out by the blank­ets and robes which must be used during a win­ter on the Plains. Will Comstock was wont to advance a theory, "That the air was so thin on the Plains, owing to the altitude of them, that no cloth could be made so fine that the wind could not blow the air between the threads." If, as is sometimes the case, these great storms come on unusually early in the season, there will be a heavy loss of cattle in the freight­ing trains, and the suffering of the bull-whack­ers and hands connected with the outfits is in­describably severe. 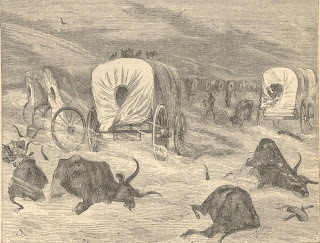 During the winter of 1865-66 not less than ten thousand head of oxen were frozen to death on the three great routes, the Platte, Smoky Hill, and Arkansas. Instances were numerous of trains meeting with the loss of two-thirds of their stock during a single night. This great loss of cattle is not the sum total of the misfor­tunes which befall the freighter or owner of the train. Sometime must elapse before cattle can be procured to replace those which have been frozen, and the proprietor of the caravan assures us that "during this interval them bull­whackers and train-hands are a eating their cussed heads off four or five times over." This is a rash statement, certainly, for a man to make who knows that the men, having corralled the wagons (that is, arranged them in the form of a circle for the purpose of securing the stock, and affording a means of defense in case of an attack by Indians), have proceeded to get out the well-worn and thoroughly marked decks of cards how much poker or high-low-jack they will play depends on the length of time they are forced to remain. They do not waste the day­light, but improve, at poker, each little shining hour. These patriots would scorn to play a game of draw for unvalued corn. The game must be made interesting in some way, the dis­covery of which is the great drawback to the enjoyment of their situation. Money they have not, for the bull-whacker - sailor of the great land-ocean as he is - differs not a whit from the genuine salt in the time-honored habit of spend­ing his last "show of color" before leaving the settlements. They will play "freeze out" poker to see who among them shall hunt the next sack of chips; that is, trudge about kicking up the snow in quest of buffalo chips (bois de vache), to be used as fuel. Which man shall herd the stock; which stand guard. Thus duties become to some extent a gambling property - a bank to be drawn upon "to make things interesting." In this beguiling away of time the bull-whack­er learns to “handle the papers" with a dexter­ity not surpassed by the sharpers who keep the Eldorado’s, Occidentals, Progressives, and other saloons of similar names which disgrace the mushroom towns that seem the fungi of the Great Pacific Railroad. It is during this season of bitter, penetrating cold that some of the "ladies of the army" learn to appreciate the situation which they have accepted as Mrs. Captain ----. 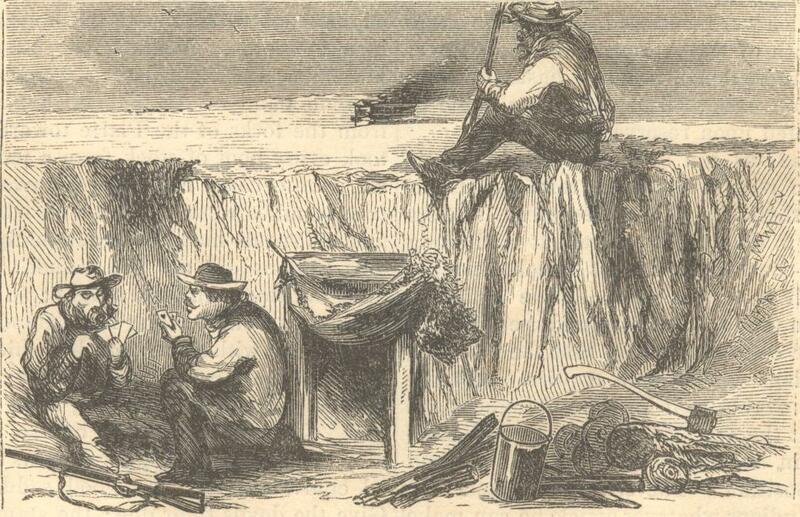 Ladies of refinement and culture frequently accompany their soldier husbands to the newly located frontier posts, where they may oftentimes live month after month in a hut, the lower half of which is a pit dug in a convenient bank, and the low wall built around it is mainly composed of sod cut in squares and laid up with mud. The roof is usually of saplings and earth. Seen from without, this structure is in appearance the veriest hovel that one can imagine. Step within, and you will be amazed at the very cozy aspect of the interior. The walls have been smoothed, then mud-plastered, and finally have been treated to such numerous coats of white­wash that they seem to be plastered. It is a successful counterfeit of a tolerably comfortable room in some decidedly more pretentious struc­ture; though, after all, not quite the place that a person would choose as the abiding-place of his family. It is in such quarters as the one just described that many an officer's wife has lived, and more than one officer's child has been born. Rude as the place may appear to Eastern eyes, this is as warm a nest as the little ones could have during the winter season on the Plains. Young ladies who visit West Point during the summer months may possibly be interested by the announcement that these sod huts are fast being abandoned as officers' quarters, and at nearly all military posts which have been lo­cated longer than a few months comfortable structures of stone have been erected for the accommodation of the garrison. The usual building material used in the construction of these quarters is the excellent, though some­what singular, sandstone that is found in un­limited quantities in nearly every location where a government post is likely to be established. A word in reference to this prairie stone. When first quarried it may be shaped into convenient blocks by means of an ordinary saw, such a one as is designated in the lumber dis­tricts as a "cross-cut." It is quite common to see the masons while engaged in laying up a wall make use of the carpenter's saw to shape any block which may not precisely suit the po­sition which the stone is intended to fill. Ex­posure to the atmosphere soon renders this soft stone as hard and firm as the best description of sandstone. In color the prairie stone is va­ried and pleasing. The sketch of an army home will convey an idea of what are, or were, the quarters of the com­manding officer of Fort Dodge, an important mili­tary post on the Arkansas River. During the past winter this was one of the depots for the supply of the troops under General Sheridan. Pos­sibly the Major has moved his family into the more respectable quarters that have lately been constructed of the prairie stone; but a warmer abode than the sod but on the banks of the Ar­kansas he will never have. The innumerable hardships and deprivations that a woman must necessarily suffer if she ventures upon the Plains would seem sufficient to deter the most energetic female from the trip; but no! Nearly every post has its ladies, who undoubtedly do much to keep up the respectability of the place, and restrain the too free license which is common at posts where there is no "lady of the army." Indians frequently visit the military posts during the winter months. They are as willing to trade during these visits as any Yankee ped­dler would be, and quite as sharp at a bargain. To an Indian there is no limit as to articles which may be secured by trade, if the party desirous of the article can offer sufficient in­ducement. A Kiowa chief endeavored to con­summate a bargain for an officer's wife, offering as equivalent such a number of fat dogs that the Indians present, thinking that the of­ficer could no longer withstand such a tempting offer, expressed a willingness to help eat the dogs if there should be more that the white chief could manage to dispose of himself. La­dies, there was no trade. In trading among themselves the Indians ex­hibit all the shrewdness and cunning which is the prominent characteristic of the race. The possessor of a coveted article takes care to turn it to the best advantage. A scene illustrating this took place on the banks of a small stream, or, to use an Indian expression, Turkey Creek, which empties into the Pawnee Fork near its junction with the Arkansas River. A Kiowa village was located here for the winter, in a fine grove of old cotton-wood-trees. The fact that the village was rich in buffalo-robes and other skins became known to a band of the Cheyenne tribe. Stealing would not answer, as there were too many Kiowa’s and too few Cheyenne’s. Some bottled whisky was obtained by the Cheyenne. How is something of a mystery, as white traders seldom make use of fire-water in their barter­ing with the red man. With their whisky the Cheyenne’s proceeded to the Kiowa village, exhibited their bottles, and dispensed smells from uncorked bottles of corn juice - giving a judicious shake or two to the bottles, that the aroma should be more en­tirely appreciated by their friends, the Kiowa’s. The smells were freely taken, and produced an uncommon desire to know more of the Chey­enne’s; pipes were produced and duly smoked; after which the visitors announced their will­ingness to trade. "They had not brought much whisky, as they did not know that their brothers the Kiowas would like to see it. The little which they had with them was good, and very strong" (with water);" when the Kiowa’s had tasted of it they would see." The Cheyenne was liberal; he would give so much for a robe (holding up the bottle and marking with the thumb something like half an inch of the whisky). 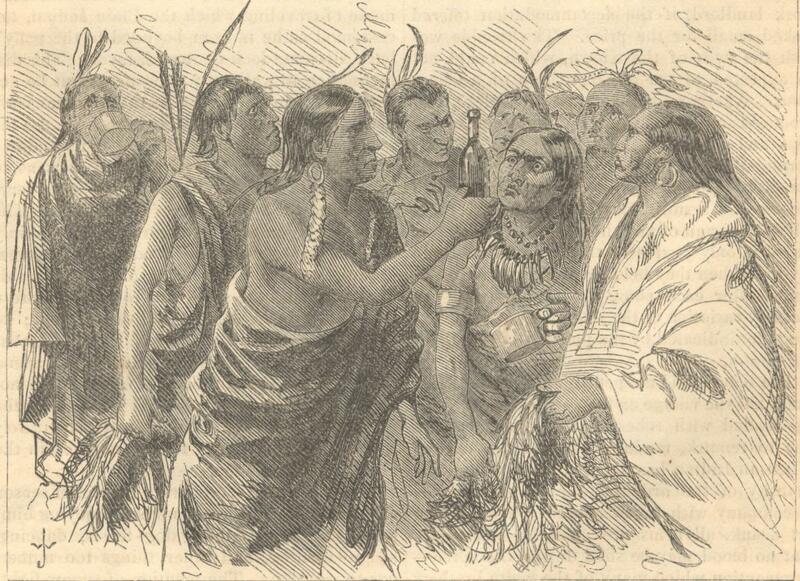 "But seeing that the Kiowa’s were not in haste to trade, the Chey­enne’s would smoke with them." Meanwhile a kindly-disposed bottle-holder was dispensing smells of the whisky to a few Kiowa’s who were loud in their announcements of the number of fine robes which they possessed. This second smoke was quickly finished, and the Cheyenne exhibited the quantum of fire-water, marking it as before by the location of the thumb on the bottle. A general exclamation followed - the position of the thumb was to the Kiowa's eyes so very much higher on the bottle. But Chey­enne had no more consideration than a New York landlord, if the accommodation offered looked small for the price. The trouble was with the eyes of the Kiowa, which could not be expected to see big like those of a Chey­enne. Another smelling time took place, and produced an instantaneous exhibition of tin cups and robes on the part of the Kiowa’s. During the pouring out of the promised grog the position of the thumb was regarded with too close a scrutiny on the part of the robe-sellers to permit of any shoving up of the gauge, and it is only justice to the bottle-handlers to say that when they held up the bottle for exhi­bition after each pour, no Indian could de­tect any variation of the line of the whisky and the point indicated by the position of the gaug­ing thumb. 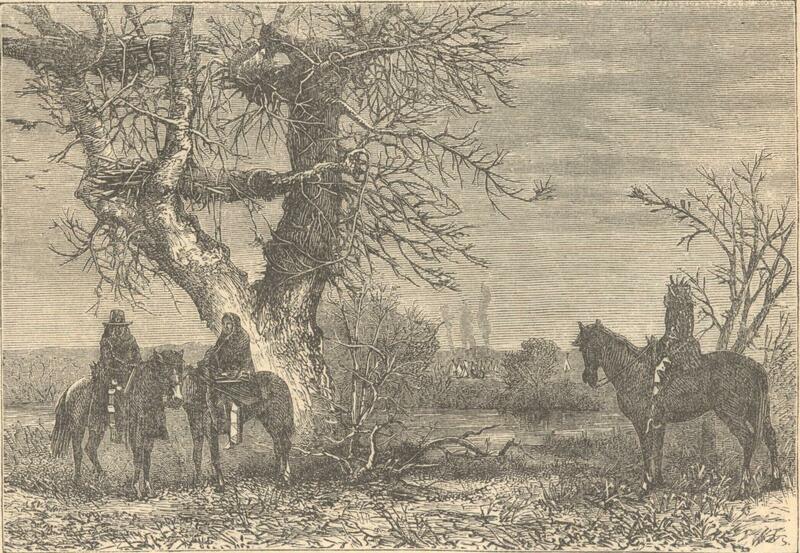 The Kiowa’s did not get drunk, and the Chey­enne’s left the village on foot, all their ponies be­ing loaded with robes - having, as they were free to remark, made "a heap sharp trade." When an Indian has secured any considerable quantity of the ardent beverage, and intends in company with a few chosen companions to get drunk, all arms are carefully laid aside, that no blood may be shed during the spree­s precaution which many of the white brothers who have lived on the frontier until they are but a trifle less wild than the Indians might do well to imitate. It may surprise some of the readers of this article to learn that many of the Indians will not drink, and not a few re­gard whisky with aversion. These do not, however, exert any powerful influence in re­straining the many redskins who are fond of the article. The latter will have it at almost any price. There is a tradition among the Indians which tells of the death of a number of the warriors of a band which found some whisky that had been left by some whites, who were en route across the Plains. The Indians drank the stuff; and a number of them died shortly, which induced other Indians to believe that a trap had been set for them. This affair has made the In­dians very careful in handling food or liquor which they may find under circumstances which may in any way indicate that the ar­ticles have been left for the redskin to find. The tradition does not state which way the party having the whisky was traveling. If they had come from Colorado, and permitted the Indians to get their hands on the genuine "Colorado round the corner," there is no won­der that the Indians bent a trifle under the weight, as the oldest settler in the Territory cannot take much of the genuine Denver make and live to go any distance with it. Winter is the "at home" season of the In­dian. 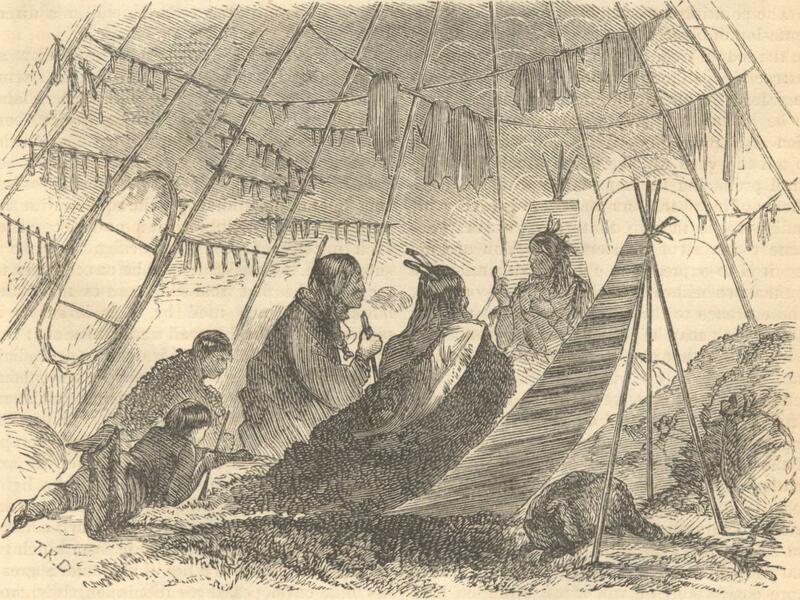 The intense cold makes the comfort of a warm lodge or tent of dressed buffalo hide appreciable. (Tepee is the Indian name for the lodge.) It is the season of rest for the Indian, who, if he would go on the war-path, must, un­less the winter is very open and the ground tol­erably free from snow, take the trail on foot, a mode of traveling which the Plain Indian, ac­customed as he is from boyhood to the pony's back, does not look upon with favor. This dis­inclination to walk may to some extent be ac­counted for by the fact that these Indians are generally very inferior pedestrians. To use the ponies even during a short campaign would so weaken and injure the tough little nags as to render them unfit for the most moderate serv­ice during the remainder of the winter. The wintering place for an Indian village is mainly selected on account of the condition of the graz­ing or grass in the vicinity. 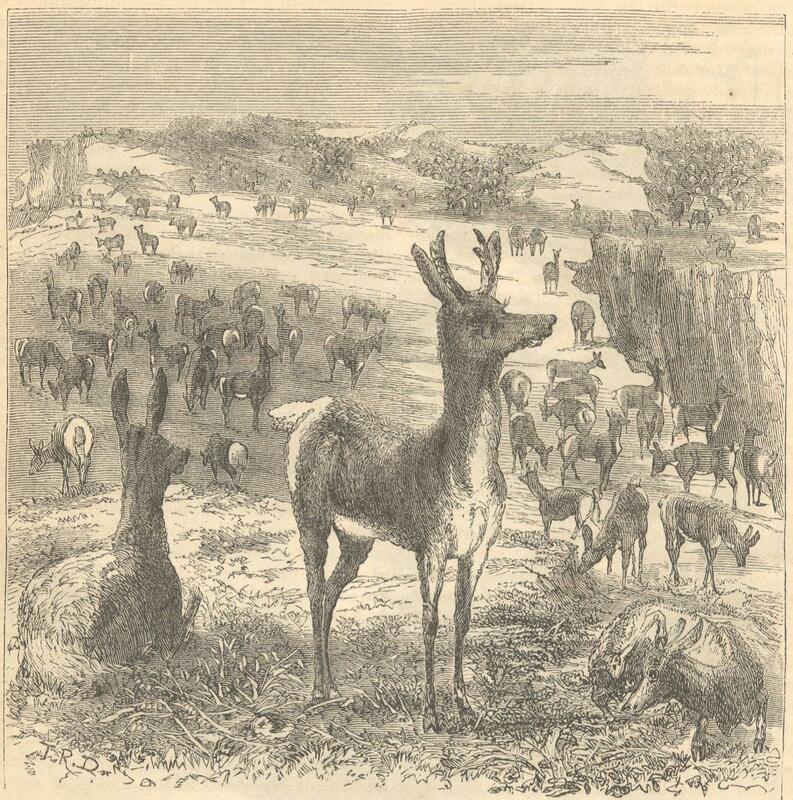 And even on this chosen ground the stock has, to use a Western expression, "a hard scratch for their rations;" to obtain which the herd will wander over a con­siderable extent of country each day, and spend nearly all the time in feeding, which could not be the case if the stock should be used on the war-path, where the grazing would be entirely accidental, and inferior to that enjoyed in the vicinity of the village. While in the village during the winter season the Indian has numerous ways of enjoying him­self - gambling, trading, dog-feasts, dancing, squaw-fighting, and other things too numer­ous to mention. The mention of squaw-fight­ing may not be understood without some word of explanation. It is this: the squaws have continual bickerings, disputes, and jealousies, and continually quarrel among themselves about the most trivial affair. To promote these wordy encounters into a regular scratching and hair-pulling scene is not difficult, and affords a pleas­ing excitement to their excellent husbands, who frequently make use of pony-whips to encourage a squaw who does not seem to enter with suffi­cient vigor into the strife which she has on hand. The ill treatment received by the squaws at the hands of the bucks, or male Indians, would seem to be sufficient to extinguish all love and feeling of respect toward these unfeeling speci­mens of the genus homo; but no, the regard of the squaw for her lord, and the tender love which she ever exhibits toward his children, might be imitated to the decided advantage of the more civilized occupants of what was once Indian ground. The little toys made by the squaws for the amusement of their children are as novel and curious as any of the Indian cu­riosities that may be seen in the village. Many of these toys are simply miniature reproductions of the larger articles which are in actual use. The papoose has its doll baby almost as soon as it is able to crawl; and, unlike the baby of the white man, the Indian infant does not make the dolly's head a favorite article for the occupation of its little mouth. The get-up of this Indian doll baby is remarkable. A queer rep­resentation of an Indian is made of buckskin stuffed with hair. The eyes, nose, and mouth are represented by beads; its garments are those of the Indian, and consist of breech­ cloth, leggings, robe, and moccasins; a small fragment of a scalp is sewn on the top of the doll's head, and so arranged as to permit of its being lifted up to exhibit the character of the article. This little scalp is braided and ar­ranged precisely like the hair of an Indian. Taking the whole affair, sewn as it is with fine sinews, you have one of the most curious of doll babies. An Indian child can hardly stand alone before it may be seen with its bow and arrows. These latter articles are never sharp, but made large at the end to give steadiness of flight and prevent damage to the children and dogs that are continually being shot at. Sharp arrows and stronger bows are given to the boys as soon as they are old enough to be trusted to go short distances from the village in quest of small game. 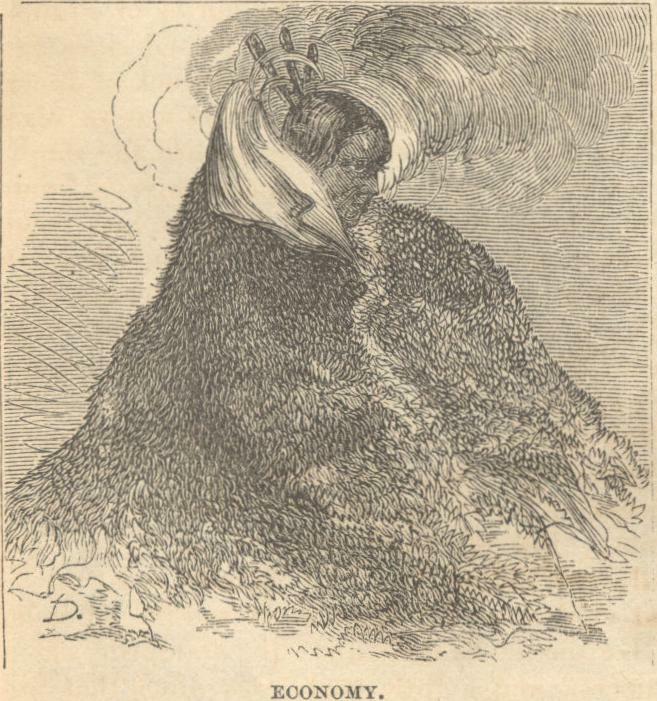 In an article on "The Buffalo Range," pub­lished in the January Number of this Maga­zine (1869), the author of this article gave some account of the labor of the Indian squaw in the preparation of the buffalo-robe as it is seen in use among us during the winter season, but made no allusion to the method resorted to by the squaws in preparing the bison skin as leath­er, to be used in many ways for the use and comfort of the nomads of the Plains. The hides that are principally used for this purpose are those which would make an inferior robe. They are first soaked for a considerable time in water, for the purpose of removing the hair, which, when treated in this manner, comes off easily. The hide is then stretched upon the ground by means of wooden pegs driven through slits cut in the edge of the skin, and treated to a thorough rubbing with water in which buffalo brains have been allowed to remain until par­tially dissolved. This renders the skin flexible, and leaves it in a semi-tanned condition. The next performance is to rub, scrape, and grind the skin down to about one-half of its original thickness, when it is again treated with the brain-water until thoroughly cured, after which a prep­aration of whitish clay is rubbed into the leath­er, and it is ready for use. A tepee or lodge made of this skin invariably seems to me a monument to the industry of the squaws that occupy it. A tepee is seldom to be seen that is composed of fewer than ten hides, and some contain as many as eighteen. The skins are invariably sewed together with sinews, and so neatly that close examination will be certain to elicit commendation from any frontier's or ranch man, who has, from necessity, some knowledge of the use of the needle himself. Located, as an Indian village usually is, in some grove of ancient cotton-wood-trees, these skin lodges, with their poles - the upper ends of which are jetty black from the smoke of the fire within the lodge - projecting a few feet above the skin covering, present as picturesque a sight as one can well imagine. You will notice while in a village that the tents vary in size, and natu­rally enough fancy that the size of the tent is to some extent regulated by the number of its occupants; but in this you would be mistaken, the larger tents being more frequently the abode of the rich Indian - the brownstone fronts, as it were, of the city, and not the modest brick, which investigation would show to contain dou­ble the number of occupants that the more pre­tentious establishment boasted. The paintings, or such attempts at the repre­sentation of objects, and characters that appear on the lodges frequently afford amusement and instruction. Short anecdotes, rather than any very lengthy history, are the principal things to be gleaned from the production of the In­dian artist; and, as each Indian will endeavor to tell the yarn which will go the farthest to­ward producing the impression with the deci­pherer of his characters that there is a very big Indian to be met in that tepee, you may see some rather strong statements. You are not required to express any opinion with reference to them; so believe or doubt, as you may choose. The entrance to the lodge is arranged with an affair which may be called a door, inasmuch as it is used for that purpose and is decidedly like one. It is simply a willow or other pliant rod bent to form an oval, and covered usually with a finely-dressed deer-skin, on which is wrought or painted the device which represents the name of the occupant - a sort of a door-plate of the gentleman whose home it is. Open this and go in. For a moment you will find too much smoke to suit your convenience, or rather eyes, but seat yourself on any of the numerous robes and you will see that the lower one crouches the more comfortably he will arrange himself with reference to the smoke. Each tepee is provided with two or more lounges or mats made of small willow rods strung upon strong sinews. These "resters," as they are designated, are fastened by means of a leathern loop to a tripod composed of three strong sticks of four or five feet in length. Try one of these and see what a comfortable lounge or spring-mattress the Indian possesses in this portable bundle of rods. This Indian bed, like nearly everything else in the tepee, is decorated with the colors of the tribe. Scattered in all directions are bags of all sizes and descriptions. The Indian seems as partial to this manner of baggage as a sailor. To the Indian this bag show is a necessity, as it enables the squaw to break up housekeeping at a moment's warning, and thus materially assists the rapid movement of a band which may have short notice of the near approach of danger. In such a case the numerous small bags are hastily thrown into large ones, the tepee comes down, and the vil­lage is on the move in less than half an hour, the lodge poles serving as a drag on which the tents and furniture are packed. In the Indian tent may be seen, too, the vari­ous implements made use of by the lady of the house in her domestic arrangements - mallets made of round stones of a variety of size and weight, fastened securely to wooden handles by means of raw hide, which is sewn while green and pliable. This, when dry, becomes so hard and firm as to bear a strong resemblance to horn, and thoroughly dry and seasoned will turn the edge of the sharpest knife. A well-made shield of raw hide, selected on account of its thickness and other necessary qualities, will turn an arrow, and oftentimes a rifle-bullet which does not strike the shield in a direct line. But this is a digression from the attempt at cataloguing the contents of the Indian's tent. Furs of all of the different animals of the Plains are, of course, plenty; so, too, are the feathers of the various birds that are to be found in the section. These latter articles are mostly se­cured by the boys, who thus take their first les­sons in hunting, and supply the squaws with the material for winging arrows and decorating such articles as they may design to make a show with. Possibly it may be unnecessary to mention the fact that the squaws make the bows and arrows used by their lords, as it seems to be tolerably well understood that the squaw does the labor that is done in an Indian village. The Indian's paint may be seen about the tent, each color in a receptacle of horn, carved and otherwise decorated; bundles of straight sticks to be made into arrows; scraps of iron to be made use of as heads for the ar­rows; strange affairs made by bending a light rod to form a circle of eight or ten inches in diameter, and crossed with a net-work of sin­ews, affording the Indian a plate from which to eat food that is not of a liquid character; great raw hide envelopes, three feet in length by two wide, and considerably painted. The squaw's trunks are also necessary articles in the Indian's household, and visible in every tent. Bundles of dried or jerked buffalo meat, and sticks or strings of this article of food, are seen thrown about with entire disregard as to the cleanliness of the location. Altogether the interior arrangement of an Indian's tent is the reverse of tidy. In nearly all villages it will be found that seven or eight Indians occupy each lodge. Of these two may be reckoned as warriors, or bucks who are capable of taking the war-path. In any attack upon the village it will be discov­ered that there are more than two fighters to each lodge, for women and children will then go into the affray with quite as much disregard of personal safety as the most highly painted brave. On such occasions, too, it is almost im­possible to distinguish the squaws from the bucks, as their dress is in many instances near­ly the same as that of the men, and the side-sad­dle is not an article to be found in an Indian village. An Indian encampment during the winter af­fords a novel scene. The youngsters are engaged in noisy sport. The bucks are lounging about, or seated in a semicircle for a smoke and talk. The squaws are busy with their va­rious duties. It is a sort of Indian paradise, watched over by the keen-sighted old warriors, who have perched themselves in the most con­venient locations for an extended view, in the contemplation of which they will remain for hours, wrapped in their warm buffalo-robes. These shrewd old sentinels can distinguish ob­jects at a distance that would seem to the un­tutored eyes of the white man an impossibility. The safety of the herd and village is the care of these watchers. This is the Indian village during peace time, which, until the past season, was simply winter, or when it was inconvenient for the Indian to go upon the war-path. As a usual thing the Indian, in selecting his win­ter-.quarters, takes care to locate the village where his food is likely to be most abundant. Buffalo, deer, antelope, turkeys, and other game are so plenty on the Plains that the Indian, when allowed to follow his own inclination, will not be likely to stiffer from hunger for many years to come. Buffalo may be seen in great herds, spreading over the Plains for miles. Deer are to be met with frequently; antelope cover the hills to the south of the Arkansas, flocks numbering thousands being by no means an uncommon sight. Wild turkeys, too, are found in droves. Will it be an easy task to keep on reserva­tions several thousand Indians that have known no other than a roving life, with these vast herds of game as their store of food, and the white man's goods and property theirs if they can take it? 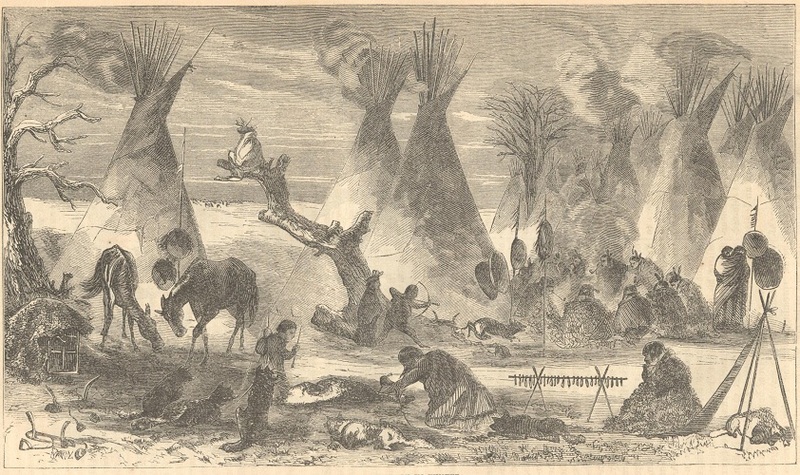 It must be remembered, too, that the bravest, best-armed, and most troublesome band of Indians that is on the Plains has es­caped without punishment for the numerous depredations which were committed by them during last summer and fall. This one band - the "Dog-soldier Cheyenne" - has committed two-thirds of the depredations that have oc­curred on the Plains. With these Dog-soldiers at large and un-whipped there is not much like­lihood of entire peace on the Plains during this summer, though it is probable that the Indians who were made to feel the power of the United States Government last winter will be some­what careful about joining as a body in any ex­tended forays against the white brother. But it is not improbable that a number of warriors from the different tribes located by General Sheridan upon reservations will go on hunting-trails which will end somewhere in the immedi­ate vicinity of the camps of the Dog-soldier Cheyenne. This is not surprising either. Wealth is to an Indian the passport to a select location in the happy hunting-ground; and un­til the "untutored savage" learns by many a hard knock dealt during the winter season, when the Indian admits that he cannot fight, there will be Indian troubles. Generals Sheri­dan and Custer have simply taken a first step - possibly this will prove a long one, but ex­perience would seem to teach differently. The moaning and lament that took place in the Cheyenne tribe-after Custer's splendid suc­cess in punishing them for the long series of outrages upon the whites was, to use an Indian mode of expression, "heard in the wind that blew on many villages;" and the cuts and bruises that the mourners inflicted on them­selves are too fresh for these Indians to make baste to merit such condign punishment as Sheridan promised if they did not keep their barbarous hands off the white brother's poll. The death and burial of a single Indian is an affair of no small importance in a tribe. If the lost one be a child, the mother is tolerably cer­tain to have a joint of one of her fingers ampu­tated. This, it seems, is an intimation that the hands were not quite up to their work, or the child would not have died. The arrangement of an Indian corpse is a matter that requires time and much mummery; after which the dead are furnished with the necessities - food, arms, tobacco, etc.- to be used during the trip to the much-talked-of hap­py hunting-ground, and the whole is incased in an outer covering made of willows arranged in a similar manner to that in which the lounges are constructed. More mourning is done; aft­er which the body is placed upon a platform constructed for the purpose in some ancient cotton-wood-tree. The feet of the departed Indian are turned with care to the southward, for it is there that the Great Spirit has his abode - so the Indian will tell you. In some favorite groves trees may be seen the branches of which have been heavily freighted with the remains of departed Indians, and eight or ten bodies may be disposed among the branches. A scaffold located on a prominent knoll or bluff seems to rank next to the tree as a propel place for the last rest of the Indians' dead. The Plains Indians - such tribes as the Comanche, Apache, Cheyenne, Arrapahoe, and Kiowa, the best riders among the Indian tribes, and users of the longest bows and arrows - are the Indians that resort principally to this elevation of the dead, though even these will sometimes dispose of their departed brethren by burying their bodies in the ground. The Indians of the Plains are few in number, peaceful, and poor, so the Cheyenne say. These Indians al­most invariably bury their dead in the ground - taking care, however, that the departed spirit shall have the usual outfit of food and extra wearing apparel. The destruction of the trees in which Indian bodies are located is not calculated to make the Indians very peaceful when they next visit the grave-tree; and it is to this wanton destruction of Indian burial-places that much Indian trou­ble may be traced. The Indian complains that the white destroys the fuel that the Indian could use for many years; and this is very true, for the white man cuts down the tree, where an In­dian contents himself with lopping off a few branches. The Indian will make a small fire and warm himself thoroughly; but the white man must make such a blaze as will compel him to warm one side while he freezes the oth­er; and it is quite the same in any fire which either will build for cooking food. Possibly the white man may not enjoy the Indian's favorite method of economizing fuel - that of building a small fire and then sitting down so close to it that a good buffalo-robe will envelop both In­dian and fire; but this is an excellent manner to get thoroughly warm, and for the Indian a successful device for the discomfiture of the vermin that infest the race. It is something after this style that the In­dian takes the vapor-bath that seems with him a standard remedy for many diseases. The mention of this fact brings to mind the excel­lent collection of botanical and mineral medi­cines that may be found in the tepee of nearly every redskin. For the collection of these sim­ples the Indian has his stated seasons, during which all the inhabitants of the village are en­gaged in the preparation of the medicine bags that are to be kept ready for use in case of need. Many of the old hags that one sees in the vil­lage are excellent nurses for the sick, and fre­quently prove themselves capable leeches. It is to these wise old squaws that many a wounded Indian owes his life, for they have most excel­lent salves and ointments for damaged flesh. Give the Indian his due, he is, if "left alone" - that is not tempted by the sight of the white man's goods and stock - entirely capable of tak­ing care of himself in almost any situation that he may choose to locate; for, by following the great herds of game, he has ever at hand as much food as he may desire, and the hides and other por­tions of the animals will serve for use in the manufacture of such clothing as he may have need of. The last few lines describe completely the condition of the Indian as the earlier ad­venturers found him. This is not, however, the present situation. Experience of years has taught the redskin that the white man, as a rule, is afraid of him, and much more ready to make peace talks than he is to fight. The knowledge of this fact has been taken advantage of until the Indian has quite convinced himself that no band of white men that wore the blue clothing of Uncle Sam were to be compared with the redskin, who during the summer season was not the wearer of any covering save dirt and paint. The reader may not be familiar with the In­dian's reason for bedaubing himself with paint, and will pardon a little digression from the di­rect train of the story if he learns that the col­ors are not used entirely for the purpose of as­tonishing a foe, but are found valuable in saving the skin from the constant peeling off that the elements would accomplish if the paint was not used. Vermilion is the best color for this use, a single application of the color, followed by an Indian-like disregard of water, will save to a person's countenance many cuticles that would otherwise peel off one after another, until it would seem that the human face is endowed with as many coverings as a cat is supposed to possess lives. Black is the favorite winter color, and reds and yellows may be regarded as fashionable for the summer. Now for the back track until we reach the point where the trail was left, with a naked Indian to mark the spot. It has been for years a custom of the gov­ernment, encouraged by the Indians, to under­take an Indian war during the summer season, and learn by the time the Indian summer came, late in the fall, that the Indians were "too well mounted," "too well armed," "too sharp," etc., etc., to be met upon equal ground during grass-time. Peace talks were then in order. These the Indians like, and are ready to engage in, as it offers an opportunity to air their fine speech, and must be accompanied with presents in order to meet with entire approval. Loaded with plunder and rich with the stock stolen during the summer foray, the Indians bag up the presents and go gaily away to the villages, where the squaws and children learn that the white men are women - how they arrive at such a conclusion is unknown - and cannot fight the Indian. Sheridan had some education in Indian affairs while stationed in Oregon previous to the breaking out of the rebellion. 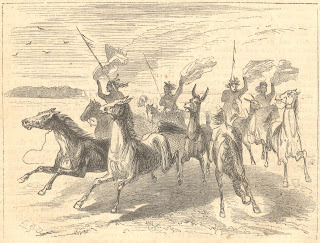 Forsyth and his scouts took a rattle at the Dog-soldiers; or, rather, they tried to make his command a skeleton one - and it certainly would have been such had the Indians succeeded in the first charge which they essayed against the scouts that fought with Forsyth on the island near the Chief Creek fork of the Republican. Next General Carr had a hand in, and used his op­portunity to the best of his advantage. These fights occurred during the fine weather which precedes winter. It was not that the white men forced the Indians to fight, but an entire willingness on the part of the Indians to make the attack, in which they evidently hoped to crush the white men with the first onset, and failing in this, they were ready to continue the fight with a persistence almost unknown in the annals of Indian warfare. Custer's "Garry Owen" fight on the Wachita was the clincher, and demonstrated to the Indians the fact that a white "walk-a-heap pony-soldier" could and would endure the hardship that an Indian shrinks from - that is, fight in the winter season. 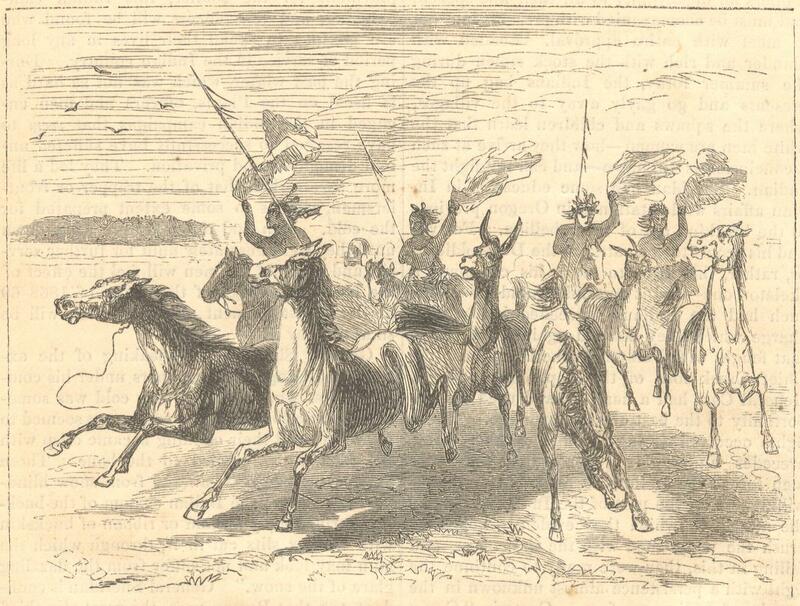 This gallant fight of the Seventh Cavalry brought a wail of lamentation from the Indian agents as well as the redskins, for it demonstrated to a certainty the fact that General Sheridan was capable of fulfilling his promise to take care of the Indians for them if the agents should prove incapable of doing it themselves. The tidings of Custer's fight no sooner reached the Indian villages, which were scattered through the game country south of the Arkansas for the winter, than the different bands made haste to heed the invitation extended in the fall to come in and be located upon reservations. If the Indians can be persuaded (which is doubtful) to remain upon the reservations allotted to them by the government, settlers will hasten to take up the excellent land along such water-courses as Walnut Creek, and the country will in a few years derive sufficient benefit from the land brought under cultivation to repay the enormous outlay that the handling of the Indians will at first require. Let the fact be thoroughly well known throughout the country that the army officer cannot with safe­ty engage in any traffic with the Indians and retain his position. The citizen can, and will, sell to the Indians whatever article he can make the most money on. If then, the Indians are under the charge of civilians, the Indian trou­bles will be quite likely to continue until the redskin is no more. It is not a pleasant employment for the soldier, this Indian cam­paigning, and few officers will be found who are anxious to spend their lives in any long period of service in the Indian country. Dur­ing the past winter, which was not as hard as is usual on the Plains, officers and men en­gaged in the Indian campaigns that seem to have resulted so successfully have suffered un­told discomfort and privation. They led a life more severe than that of the trapper or front­iersman, who is to some extent prepared for the cold. Men and animals were worn down until they were absolutely unfit for further serv­ice, and many of the men will feel the effect of the Indian campaign of the winter of 1868-69 until the last moment of a life which will be shortened by it. General Sheridan, in speaking of the ex­treme suffering of the troopers under his command last winter, says, "The cold was some­thing indescribable. The men's eyes seemed to freeze up, and their clothing became crisp with the frost which chilled to the bone. Those among the men that suffered from snow blind­ness resorted to the Indian custom of the buck­skin strip, simply a band or ribbon of buckskin with narrow slits cut in it, through which the man may look and not suffer from the dazzling glare of the snow." General Sheridan is confi­dent, too, that Roman-nose, the great war chief of the Cheyenne tribe, was killed in the battle fought last fall by Colonel Forsyth, at the Chief Creek fork of the Republican. Should this prove true, there is every reason to believe that there will be no need of repeating the winter cam­paign on the Plains, as Roman-nose was the great hater of the white man, and the bravest and best fighting Indian on the Plains. The endurance of the white man, when fairly tested against that of the Indian, will be found equal, if not superior to it, as not a few small bands of Indians have discovered to their cost, when they have taken advantage of an unguard­ed moment to stampede the horses of Plains­men or scouts. Years have passed since the December day when, just at the crack of dawn, a small band of Arrapahoe, that was en route from the forks of the Platte toward the south, took every hoof of stock from a party of hunt­ers, whose camp had been for two days some twenty miles west of the island where Forsyth and his scouts made their gallant fight last fall. The Indians did not fire a shot. They were after the stock, and not a fight; so through the camp they went howling like demons - each In­dian armed with a buffalo-robe, which he swung through the air, frightening the ponies into breaking lariats and drawing knots and picket-pins. But the stock was not so cheap, after all; two Indians left their remains as a wretch­ed equivalent for nine good saddle animals. Give the devils their due: the stampede was a success, and a little party was afoot that did not take kindly to the situation. Before sun­up that same party was on the trail of the stolen stock, carrying just as little duffle (food and clothing) as could be made into a small pack for the back. The story of that trail would be too long a narrative. Day after day the little band toil­ed on, the greater portion of the time through snow which had crusted just sufficiently to break through under foot. The suffering for food was intense enough to make any live animal a cov­eted treasure. But two of that party are now alive. One by one the Indians got them. During the cold spell, as the Western man is prone to designate winter, the dug-out is a fa­vorite abode of the genuine Plainsman. With his long experience he knows no warmer loca­tion than a cave dug into the bluff or bank near running water. It is a safe retreat too; and a great many Indians would hesitate before at­tempting to unearth a customer whom they pre­fer to let alone - the frontiersman in his winter­ing-place on the Plains. Harper’s New Monthly Magazine. June 1869.